OTTAWA - An Ojibway activist is calling on the federal government to include domestic abuse in a forthcoming inquiry exploring the issue of missing and murdered aboriginal women. Joan Jack, a retired lawyer who ran to lead the Assembly of First Nations in 2012, says the inquiry should include the entire spectrum of vulnerabilities faced by aboriginal women both on- and off-reserve. "At one end you have domestic violence and at the other end you've got the serial killer," Jack said in an interview. Some women in indigenous communities are reluctant to come forward to talk about the abuse, which is a product of colonialism and the legacy of residential schools, said Jack, who is from Berens River First Nation in Manitoba. "I think the only way women would talk is if their comments were kept anonymous," she said. "They're scared because when you're being beaten up, it is scary." Perpetrators may be related to people in power in tight-knit communities, she added. "If you decide to talk ... it just doesn't affect your personal safety," Jack said. "It affects your ability to benefit from the limited resources that we have." Jack also said she would like to see aboriginal leaders focus more on teaching indigenous men about sexism, in addition to giving them the opportunity to build self-esteem. The high levels of violence in many communities has been on the radar of the Native Women's Association of Canada for decades, said president Dawn Lavell-Harvard. "We don't have the same supports as other communities and then the increased vulnerability when our women go to urban and rural settings and level the communities and things are even worse," Lavell-Harvard said. The inquiry will need to examine the complete picture in order to be effective, she added. 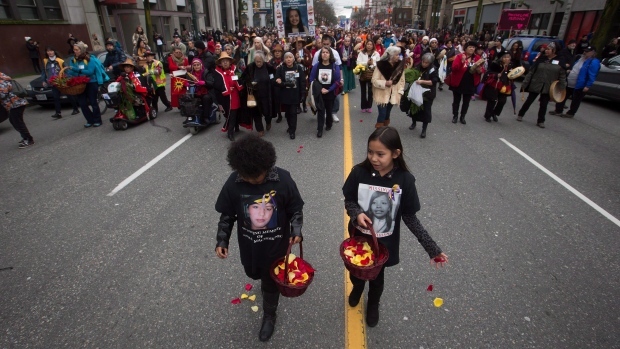 On Tuesday, Indigenous Affairs Minister Carolyn Bennett emphasized that the inquiry would need to examine the root causes of the violence, going beyond a mere tally of missing and murdered women. The issue of domestic violence is still "almost routinely linked" to the effects of residential schools, as well as the effects of child abuse and the child welfare system, she noted. "Unfortunately in some families, you will end up with the perpetrator and the victim," Bennett said. "Even though the statistics will show that indigenous women are slightly less likely to be killed by an intimate partner or former partner, all of these issues have to be dealt with. Lavell-Harvard said the government should take immediate action to provide more shelter spaces for indigenous women in crisis. "That needs to be addressed right away," she said. Bennett said the government is aware of a need for more safe houses and additional shelter space both for indigenous communities and in the urban centres.